... lowers secondary processing time and significantly reduces worker handling. 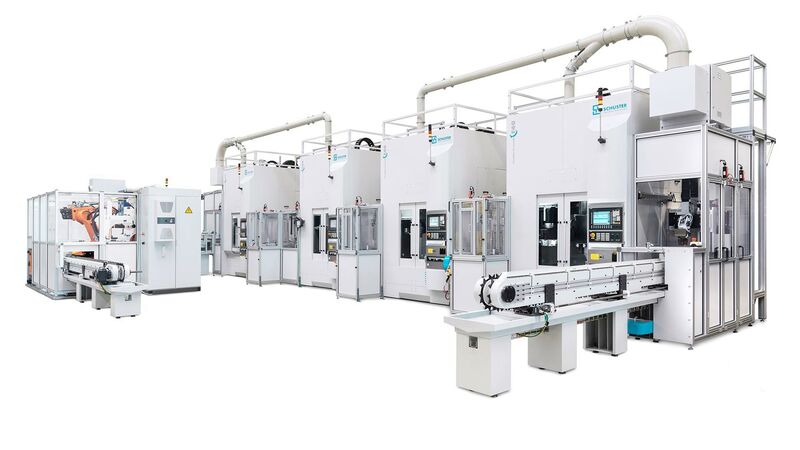 The use of the Schuster line with a consistent degree of automation has resulted in a considerable increase in productivity per unit area. Thanks to the Schuster line, operations formerly requiring a production space of 375m² can now be accommodated in only 135m². Over a production space of 135m², 11,000 shafts are produced per month, while the plant as a whole achieves an overall availability of 95%. Not only has automation lowered secondary processing time by 10% but worker handling has also been reduced significantly. All shafts are clamped between spikes and run through the system fully automatically, from turning to grinding and even packaging and shrinking. Buffer conveyors have been incorporated for automating machine tooling. 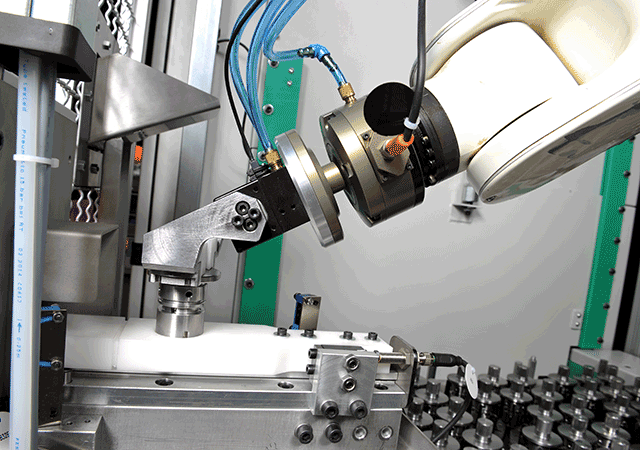 Robot-assisted marking unit for labelling workpieces. Whether labelling a shaft, as in this case, or the front face of a flange, Schuster's customer-oriented solution management has the ability to meet virtually all requirements. Marking with constant depth, even for small parts. Schuster Maschinenbau often implements as part of turnkey projects complete automation cells for the loading and unloading of workpieces. 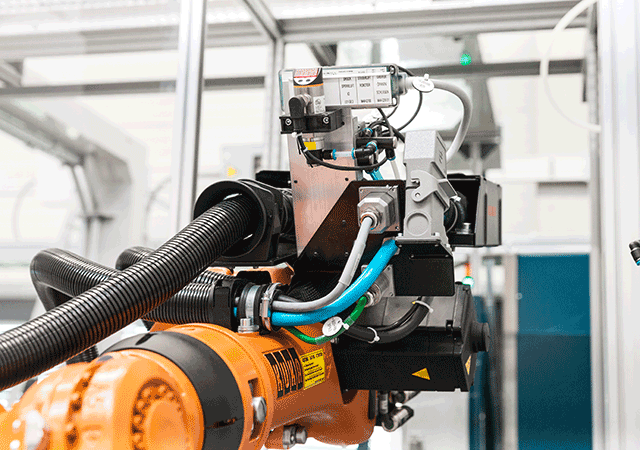 This could be from simple handling axes to complex robotic cells with integrated quality measurement systems. For this purpose, modular concepts have been developed, so that these automation cells are also used for automated loading and unloading of machine tools from other manufacturers. 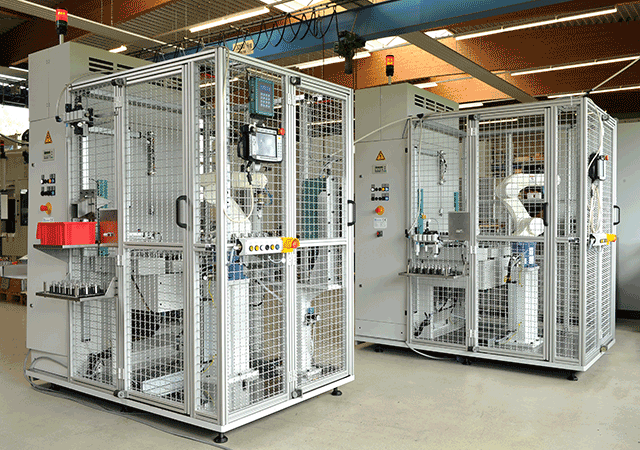 We plan, develop and produce palleting systems, bar loaders and bundle loaders for your requirements, so whether for existing machine applications or for new systems, such as one of our Schuster F-P-V turning cells, Schuster Maschinenbau offers a whole range of automation solutions that guarantee a very high plant autonomy time. An NC-controlled feed unit with a power of 2 KW transports the material bar at up to 450mm/sec. The bar exchange speed of the loader is approx. 10 seconds and its loading capacity is max. 8000kg (diameter range 5-50mm and bar length of 6m up to 12m). When the clamp opens, its load is subjected to a NC-controlled feeder with no delay. The precise position is achieved by means of a NC-material feeder. 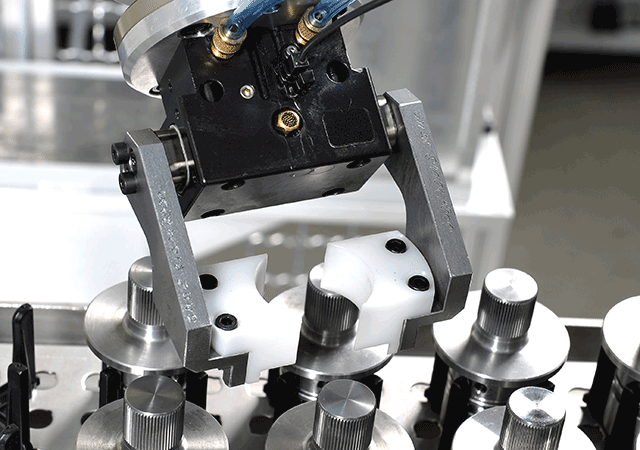 Do you have any questions regarding the automation of manufacturing processes? Simply fill in the form. One of our specialists will get in contact with you and will give you competent advice.